In affiliate marketing, it sometimes seems like we live and die by the calendar. Maybe it's just me, but I'm usually thinking about a major holiday (and its resulting sales opportunity) weeks or months ahead of time. My latest obsession: Valentine's Day. Valentine's Day is the next holiday we can all count on to drive consumers to buy and (thankfully) more of them are choosing to buy their gifts online (US ecommerce sales increased by 12 percent in 2012). At Commission Junction, we spend a lot of time looking at retail trends. So, to get a sense of what consumers might be buying as Valentine's Day gifts this year and, equally important, when they'll be buying, I dug into the CJ sales data for Valentine's Day 2012. What top items sold in the CJ Network didn't yield any surprises—flowers, gifts, lingerie and jewelry still dominate—but, consumers made some surprising decisions on when they shopped. So, publishers take note—Valentine's Day shopping is happening WAY later than you probably realized. V-Day's D-Day (February 7): As a network, we begin to see sales likely related to Valentine's Day begin to ramp on February 1 and reach a crescendo on February 7. Shoppers seem primed to pull the trigger on a purchase on this day, likely due to shipping deadlines. Because of this, I think there is a lot to be gained by publishers heavily promoting advertisers with Valentine's-related products and offers on this day. Last year, Gifts, Women's Apparel, Computer Hardware and Kitchen advertisers all saw sizeable gains on this day along with the Jewelry advertisers. Additionally, publishers should keep an eye out for advertisers in the Discounts category that offer Valentine's Day dinner or romance deals—these proved very popular with consumers in 2012 and resulted in strong sales spikes whenever they were promoted. Flower Power: Presenting flowers to a loved one on Valentine's Day is de rigueur. 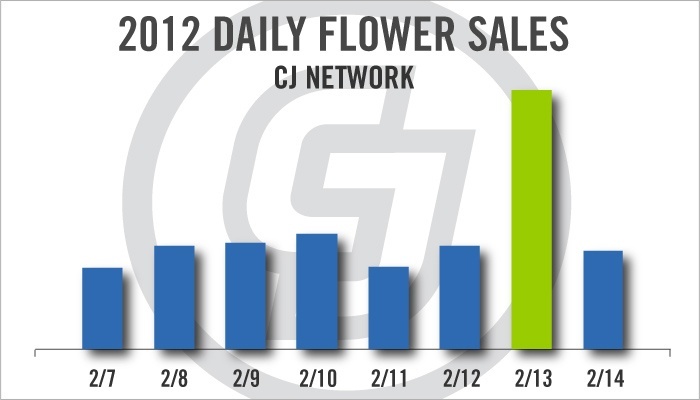 So it's no surprise to see sales for CJ Network's flower sellers rise the week before Valentine's Day. But what is surprising is the volume of orders that occur at pretty much the last minute. The graph at the top showing daily flower sales from last year says it all. Smart publishers will be promoting flower advertisers which offer same-day delivery up until the last minute. Additionally, many flower purchases last year were completed via mobile devices, so publishers should consider how they can tap into this behavior, possibly by highlighting advertisers with CJ Mobile Certified websites. Not to be overlooked is the Valentine's Day card. Valentine's Day is not immune from the growing trend and popularity of interactive e-cards, likely because e-cards have evolved and can now be personalized with a sender's own photos and voice. Affiliates can tap into this trend by promoting the personalized print card and e-card advertisers in our Greeting Cards category throughout February, and then e-cards exclusively on Valentine's Day itself. Affiliates should also bear in mind that Valentine's Day gifts have evolved with the times. Flowers, jewelry and chocolates are still the most popular gifts, but network sales from February 2012 showed increased sales volumes in small electronics and related accessories and increases in toys and sporting equipment. So, Valentine's Day is likely a good selling opportunity for many more advertisers than in the past—take advantage and join these programs today! CJ Publishers can also use the New Links tab in Account Manager to search for Valentine's Day affiliate marketing promotions.